In an effort to expand and improve our peer-to-peer fundraising functionality, we've made some key updates to both the fundraiser signup experience as well as the fundraiser interface! With these recent changes, we've streamlined the fundraising page setup process to help your fundraisers most effectively build out their page, optimized the fundraiser interface for mobile (that's right, they can edit their page from their phone! ), and enhanced the fundraising page interface. We know that storytelling powers fundraising, so we've enhanced the setup to include a space for your fundraisers to craft their story before their page goes online! Your organization still can set up a default fundraiser appeal to guide them, adding the fundraising appeal section gives the fundraiser the opportunity to make the next step to customize their page and take ownership of their fundraising appeal! When a fundraiser has created their own personal fundraising page, they're pretty excited to start fundraising on your behalf and put the page out there. In light of this, we added sharing as the last step in the fundraising page setup process, giving them the opportunity from the get go to promote their page to their family and friends as soon as their page goes live! With the addition of the sharing page during the setup process, your fundraisers can quickly post on social media and expand your campaign's reach. While our campaign sites, fundraising pages, and fundraiser signup has been optimized for mobile for quite some time, we've now updated our fundraiser interface to be mobile optimized as well! Now, fundraisers can login to their account on any device to make changes to their appeal, update their fundraising page details, write blog posts, and share their page using our quick sharing tools. With over 50% of activity happening on mobile devices, this added optimization feature is bound to drive additional fundraiser engagement! In an effort to direct fundraiser's attention increasingly towards their progress, we've dedicated a larger space and larger text to the fundraiser's progress, with quick and easy sharing tools (including the new Facebook Messenger, Google+, and Email sharing options!) to help inspire them to share their page more. 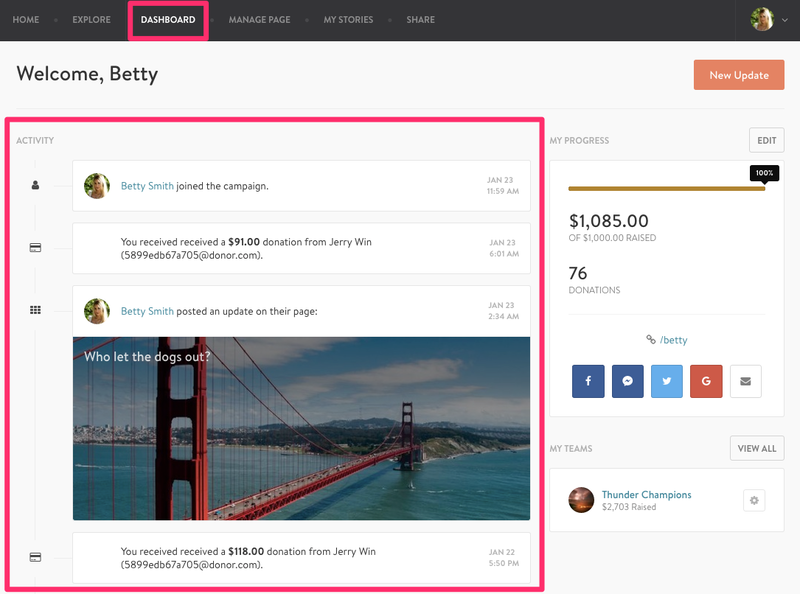 The improved fundraiser activity feed inspires fundraisers to not just focus on donations coming into their page, but engage with campaign activity as a whole. By encouraging engagement with others and showcasing campaign activity, the campaign comes alive to fundraisers and can inspire them to engage with other's content and even create their own. Our new navigation makes it easier than ever for fundraisers to edit their page, update their appeal, write blog posts, share on social media, explore other fundraising pages, and navigate back to the main campaign! This updated navigation encourages the fundraiser to learn more, participate, and become invested in the campaign! We're excited to introduce these new features as an update to functionality and enhance peer-to-peer fundraising for all our users. By instructing your fundraisers about the new features, you'll be able to further engage them in your campaign and raise more funds!